Many families attending the Emergency Department of the Royal Infirmary of Edinburgh receive devastating news. This is especially true for many of those whose relatives have suffered an out of hospital cardiac arrest. 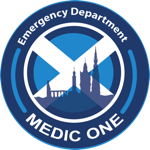 There are around 400 such events each year in the Lothian region, which is the catchment area of the Royal Infirmary of Edinburgh, making them the most common immediately life threatening medical emergency with a low rate of survival. Despite cardiac arrest being an active area of research within our Emergency Department for over 30 years and the creation of the Resuscitation Rapid Response Unit, a pre-hospital service that attends 85% of all out of hospital cardiac arrests in the area and which has resulted in a systematic improvement in survival of cardiac arrest victims, around 3 in 4 patients who arrive at the Emergency Department in cardiac arrest will die in the department. Despite many of these patients having previously expressed a desire to donate their organs in the event of their death until recently it has not been possible to fulfill this wish due to the sudden and unexpected nature of their death. Developments in transplant techniques have now made possible the use of organs from patients who die suddenly in the Emergency Department after an out of hospital cardiac arrest. The relatives of such patients, who had previously expressed a wish to donate by signing up to the Organ Donation Register (currently 49.8% of NHS Lothian are on the Organ Donation Register), and who fit the criteria for donation are now being offered the possibility of organ and tissue donation as part of the RIE Emergency Department’s Uncontrolled Donation after Circulatory Death programme. Last month, a patient who suffered an out of hospital cardiac arrest in Edinburgh, became the first person in Scotland to donate their organs in such a manner, and the first in the United Kingdom to donate using a newly developed technique of organ preservation termed Normothermic Regional Perfusion. On this occasion the decision of the patient and family led to two patients receiving kidney transplants. When a patient suffers a cardiac arrest, their heart ceases to function. Unless the heart is restarted very soon afterwards then this is irreversible, hence recent focus on early bystander cardiopulmonary resuscitation (who could forget Vinnie Jones’s Hard and Fast campaign) and the local development of the Resuscitation Rapid Response Unit. Once a patient reaches our Emergency Department without the Rapid Response Unit being able to restart their heart, death is usually inevitable. When this is imminent, and if in accordance with the patient and their family’s wishes, steps are put in place to ensure that once death occurs, organ preservation can start immediately, a procedure that lasts around 20 minutes. After this time, the patient’s family can visit them and the Emergency Department’s bereavement processes take place, prior to the patient’s kidneys and sometimes liver being removed around 4 hours later for subsequent transplantation. The suddenness of cardiac arrest means that families have to be asked to agree to organ donation very soon after hearing that their relative will not survive. It is undoubtedly a difficult time to consider such a request and the gift that such patients and their families make to others is truly special. This April, the Emergency Department have chosen organ and tissue donation as the theme for our monthly awareness campaign in order that more patients are able to receive such an amazing gift.